Pictured from left, John D. Meadows, Nick Nelson, Dennis Brumfield, Larry Hill, Charles Craft, John Bumgarner. Each veteran received a unique Quilt of Valor, made by members of the Quilts and Things Guild. POINT PLEASANT — The tradition of making quilts is often as special as the tradition of gifting one. 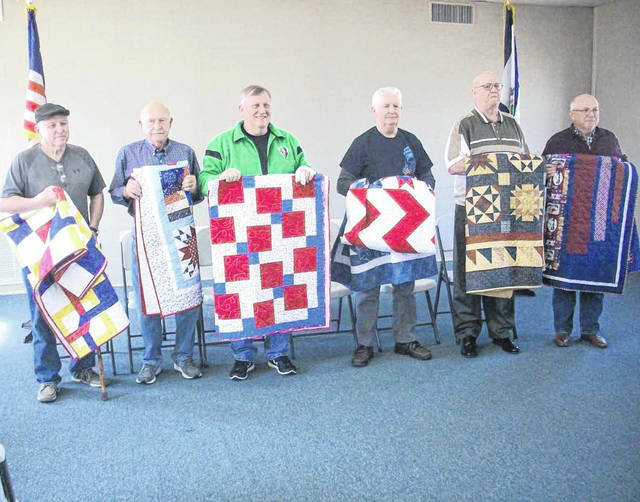 Last Saturday, the Quilts and Things Guild presented a Quilt of Valor to six veterans. Quilts of Valor is a national program that gives quilts to veterans all over the country to honor them for their service to their country, during all wars and conflicts. The following local veterans were honored with quilts: Nick Nelson, John D. Meadows, John Bumgarner, Dennis Brumfield, Larry Hill. Joe Antal was unable to attend and will receive his quilt at a later date. During the presentation, each veteran spoke about their specific branch of service and where they were stationed, some spoke of stories from their time on active duty. After the presentation, refreshments were served to the veterans, their families and friends. Quilts of Valor has become a tradition for the Quilts and Things Guild, starting in 2005 when they created six quilts and sent them to veterans from West Virginia who served in Iraq and were patients in Walter Reed National Military Medical Center in Bethesda, Md. Since 2016, the Guild has made 48 quilts, all going to local veterans who were presented the gifts at a special Quilts of Valor reception. As previously reported, the quilts are all made by Guild members, some of whom create the pieces and some who actually quilt the pieces. No matter who does what, it is always a definite group effort. Information for this article submitted by Jane Coles, chairman of Quilts of Valor, Quilts and Things Guild.